More than 100 people have been killed at a protest by supporters of ousted Egyptian President Mohammed Morsi in the capital, Cairo, doctors say. They said more than 1,500 were also hurt. The state health ministry says 38 people had died – 180 injured. 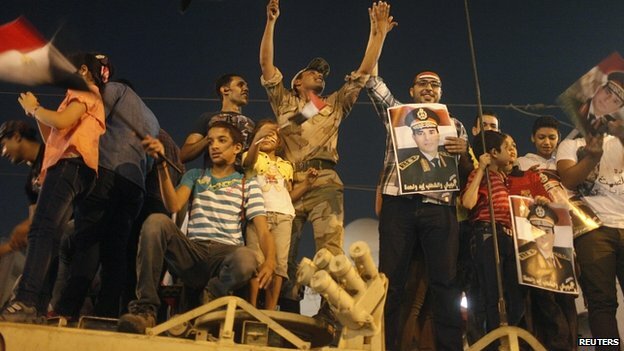 The army ousted Mr Morsi on 3 July. He has been formally accused of murder relating to a 2011 jail outbreak and of links to militant group Hamas. 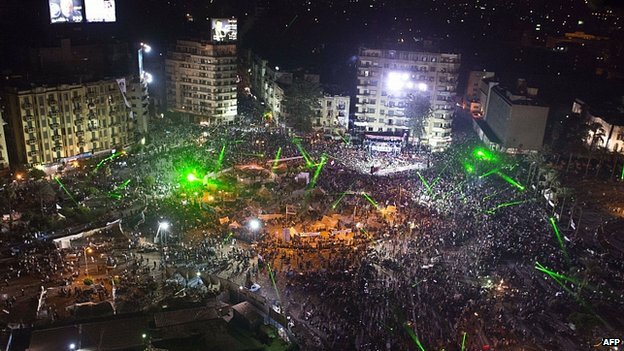 Pro- and anti-Morsi supporters staged huge protests overnight in the capital. Many thousands occupied Cairo’s Tahrir Square in support of the army, after its chief, Gen Abdel Fattah al-Sisi, had urged people to demonstrate to provide a mandate for its intervention. Meanwhile, tens of thousands of Morsi supporters continued their sit-in protest at the mosque in the Nasr City area. On Saturday, Interior Minister Mohammed Ibrahim vowed to end the sit-in, saying local residents had complained about the encampment. He said the protest would be “brought to an end soon and in a legal manner” with an order from the prosecutor, although this has yet to happen. The BBC’s Jim Muir in Cairo says the latest violence is the most serious since the army’s intervention to remove President Morsi, but this does not appear to have been a planned campaign to clear the area around the mosque. 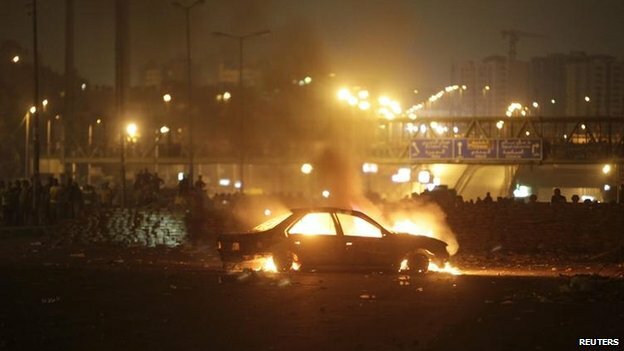 It appears the violence began after some of the Morsi supporters tried to block a main road in the area overnight and security forces responded. 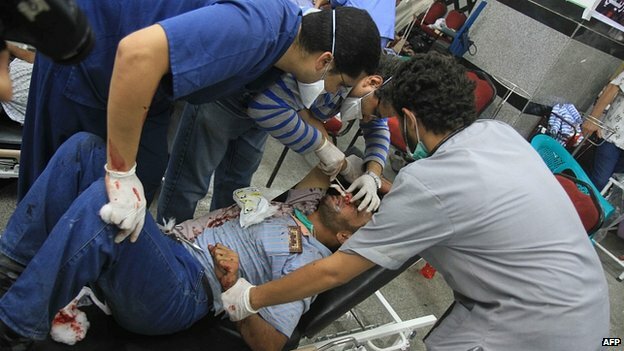 The health ministry issued a lower death toll of 38, with 180 people wounded. State news agency Mena quoted a security official as saying that live fire had not been used, only tear gas. The official said security forces had been trying to stop fighting between rival sides and that eight security personnel had been injured. Our correspondent says medics at the hospital believed about 70% of the casualties were caused by live fire – with many of the victims hit in the chest or head by snipers firing from rooftops. A senior Brotherhood politician, Saad el-Hosseini, told the agency that this was an attempt by security forces to clear the mosque area. “I have been trying to make the youth withdraw for five hours. I can’t. They are saying they have paid with their blood and they do not want to retreat,” he said. Our correspondent says Morsi supporters are furious about the role the military is taking, and in particular Gen Sisi, who they say is killing Egyptians. 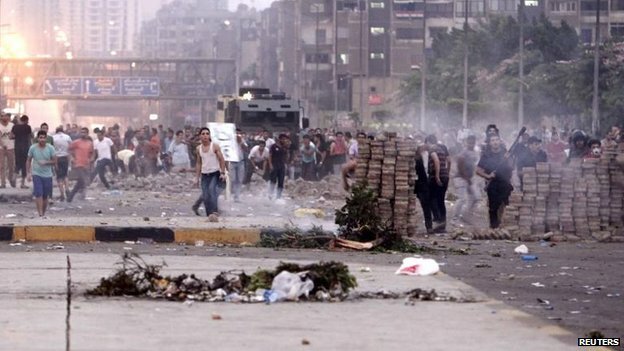 The clashes erupted overnight and continued into the morning in Cairo. Egypt’s pro-Muslim Brotherhood TV station, Ahrar 25, quoted the coalition that supports Mr Morsi – the National Coalition for Supporting Legitimacy – as saying it held Gen Sisi responsible for the deaths at the mosque protest. 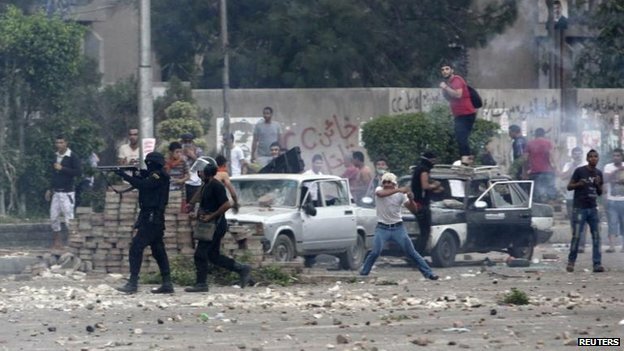 There has also been violence in Egypt’s second city of Alexandria, where at least 10 people have been killed in clashes between rival factions. European Union foreign policy chief Catherine Ashton said she “deeply deplored” the latest deaths in Egypt. A spokeswoman said Baroness Ashton called “on all actors to refrain from violence and to respect the principles of peaceful protest”. Mr Morsi, the country’s first democratically elected president, has now been formally accused of the “premeditated murder of some prisoners, officers and soldiers” when he and several Muslim Brotherhood leaders were freed during a breakout at a Cairo prison in January 2011. He is alleged to have plotted attacks on jails in the uprising that overthrew President Hosni Mubarak. Mr Morsi is also accused of conspiring with the Palestinian militant group Hamas, which governs the Gaza Strip and has strong links with the Muslim Brotherhood. Mr Morsi has been formally remanded in custody at an undisclosed location for an initial 15-day period, a judicial order said. The order issued on Friday was the first official statement on Mr Morsi’s legal status since he was overthrown. Two human rights activists visited Mr Morsi’s undisclosed place of detention on Friday, although he reportedly refused to meet them, instead sending his chief of presidential staff Refaa el-Tahtawy – who is also held at the location. Mr Tahtawy told the visitors they were being treated well but complained that they were unable to meet relatives. On Saturday, the interior minister Ibrahim said that Mr Morsi would be transferred to Torah Prison, where Mubarak is being held.